Graves Motorsports LINK™ Full Titanium Exhaust System for the 2009-2014 Yamaha R1 with carbon fiber canisters. GMS LINK ™ Exhaust systems are designed for the elite rider seeking top of the line performance, fit, finish and value. 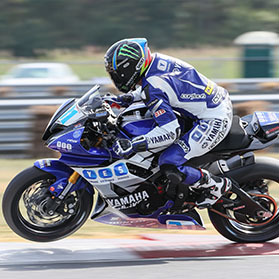 This R1 exhaust system was developed using the same technology that has powered Monster Energy Graves Yamaha riders to 7 consecutive Moto America / AMA Superbike championships along with numerous 600cc titles. This product is intended for closed course competition use only. Use of this product for any other purpose is strictly prohibited. This combined kit features all three of the LINK™ exhaust component options to complete your Yamaha R1 with the full Graves LINK ™ exhaust system. New Diamond Shaped Can Designs (Carbon Fiber Cans with Carbon End Cap), designed to match the R1's body lines. Cans mount directly to the sub-frame without the use of straps, saving weight and streamlining looks. Dual Lamba sensors come standard. Featuring stock sensor and Dynojet Auto Tuner sensor adaptability. Stock Full System Weight = 23lbs. LINK ™ Full System Weight = 9.8lbs (see break down below).